This brand of online casino games may not be the biggest one in the industry, but it certainly is a high-quality one. Quickspin has been around for just a few years, and in that relatively short time-span, it has created a number video slots which can be found in many different online casino lobbies. The image of Quickspin seems rather informal and fun. For example, their CPO’s quote which is featured on their website is “We make slots we love playing ourselves; we’re just lucky that others share our taste”. And you can really tell that the creators at Quickspin seem to love what they do. Their products tend to be very original, as well as interesting and extremely well animated. At the time of writing, this developer has created about 40 different casino games. All of them are slots and all of them are fun. Some of these products do tend to be more popular than others, of course. Three of their most played slots are Second Strike, Big Bad Wolf and Razortooth. The first one has a primary feature which will give you a chance to qualify for an additional prize after every winning combination. Hence the name, Second Strike! Get any winning combination and wait for the feature to be activated. You will then see a circle of symbols around the game screen and a highlighted symbol which goes in circles until it eventually stops, kind of like a wheel of fortune. If it hits the same type of symbol with which you just made a winning combination, then the number of winning symbols in your screen will be doubled straight away! The Big Bad Wolf slot is obviously based on the fairy tale with the three little pigs. Its general setup is not unlike other video slots, however the goal isn´t just to make winning combinations… You will also need to help the big bad wolf blow away the pigs´ houses and go for the main prize! Then finally, Razortooth is about an animal which can no longer be found on this planet: the razor tooth tiger. You will see this animal jump through your screen on several occasions, while there are also many other extinct animals to be found on the reels. And whenever this enormous tiger uses its claws, wild symbols will appear! The most interesting feature that you may run into is the full-reel wild which you will see on many occasions during the free spins bonus game! 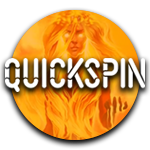 Just like many other companies that make online casino games, Quickspin AB is originally from Sweden. That means their headquarters are based in Stockholm, but they certainly aren’t bound to the borders of that country. After starting the company in 2011, they got their first licence from the Alderney Gambling Control Commission in the UK. At this point, they also have licenses from the MGA and the UKGC, which are arguably the most reliable names in the industry. You can now also find them at iGaming conventions all over the world, where they are showcasing their products to the public and where you can talk with the developers in real life. If you are particularly interested in playing the games of this brand, then there are a few different ways for you to recognise them. The first way is kind of a big giveaway: You will see their logo in big orange letters in the middle of your screen once you open one of their slots. That should really be the only thing you need to know, but there are more unique qualities that their games possess which you can also use to recognise the underlying brand. Primarily, the interface is very telling when you’re trying to find out which company made a slot. In the case of Quickspin, you will see a squarish bar in the bottom of your screen with lots of orange. This includes two small buttons for the information screen and the settings menu, followed by your balance and the number of active bet lines. After that, you will also see the current bet size, the amount of money you just won, another two small buttons which refer to the re-spin option and the quick-spin option, and of course the main spin button. The good thing is that the bet size can be selected from a list of available amounts. That means you won’t need to mess around with bet levels and coin values, as you would with many Netent slots. This will make it much easier to navigate your way through the available settings, leaving you more time to enjoy the actual gambling experience.